TropiDog Senior All Breeds – rich in TURKEY, with RICE is a complete high-quality balanced food for older dogs (> 7 years of age) of all breeds and sizes. It provides essential nutrients in the form of easily digestible nutrients and many nutraceuticals with pro-health effects on the body, proven by numerous scientific studies. 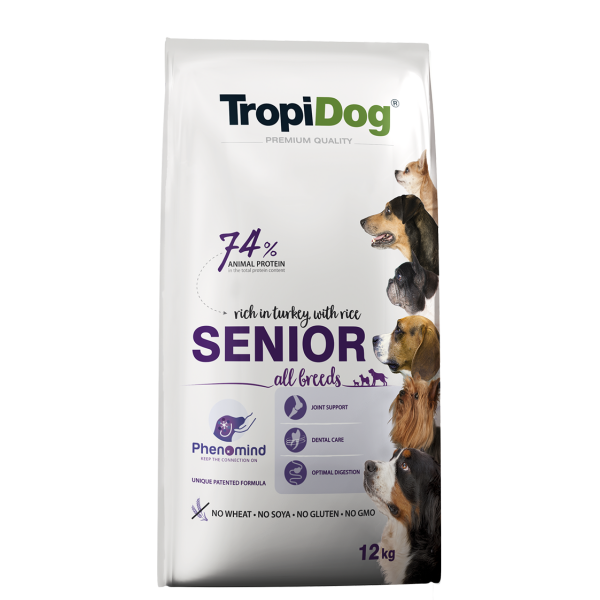 TropiDog Senior All Breeds – rich in TURKEY, with RICE has a reduced protein content compared to adult dog food, adjusted to the needs of ageing dogs. Natural active components. Improve anti-oxidant status. Better brain function performance. Improve memory performance PHENOMIND is the trade mark of and is used under licence from Diana Pet Food. Dental Care Specially designed porous granules of suitable hardness allow for mechanical cleaning of the teeth surface, while the addition of sodium polyphosphate hinders the formation of dental tartar and protects the gums. Joint Support Glucosamine and chondroitin facilitate the reconstruction of joint structures, strengthen the cartilage and make it more elastic while Omega 3 acids contribute to the reduction of inflammation and help to maintain joint mobility. This allows your dog to stay active for longer. Optimal Digestion Easily digestible ingredients, low share of dietary fiber and natural sources of prebiotics: chicory inulin, fructo-oligosaccharides (FOS) and mannan-oligosaccharides (MOS) support the proper functioning of alimentary tract and the restoration of a beneficial bacterial flora. Thus, they have a positive effect on optimal intestinal peristalsis and proper stool consistency. 74% high quality animal proteins! Monoproteinska hrana z lososom za občutljive pse majhnih pasem. SUPER PREMIUM suha hrana s piščancem in lososom za odrasle pse srednjih in večjih pasem.